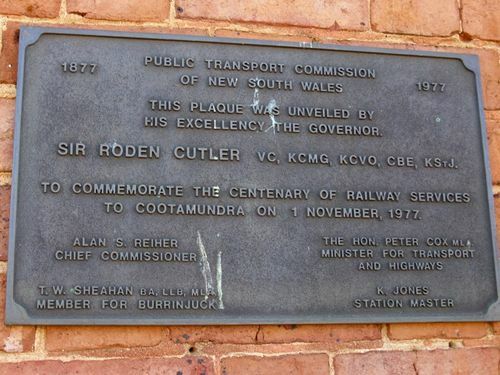 A plaque commemorates the centenary of railway services to Cootamundra. 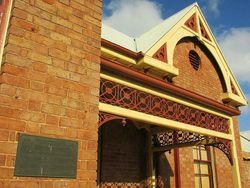 Contracts were let in 1877 for construction of a temporary timber station building, goods shed, and Station Master’s residence, with Cootamundra station opening on 1 November 1877. The line from Harden to Cootamundra was opened by Mr. John Lackey, Minister for Justice & Education, who, along with the Commissioner for Railways, John Rae and other dignitaries, led a procession through Cootamundra before attending a banquet and ball in the newly constructed goods shed. (Forsyth, 1989). This plaque was unveiled by His Excellency the Governor Sir Roden Cutler VC, KCMG, KCVO, CBE, KStJ. to commemorate the centenary of railway services to Cootamundra on 1 November, 1977.